Finding ethical gifts isn’t always easy. That’s why I am really pleased to have discovered UncommonGoods, a website dedicated to making gifting more sustainable. 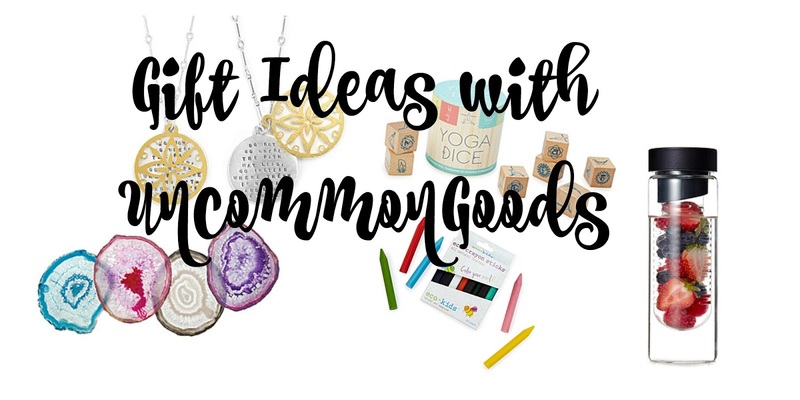 UncommonGoods is a certified B Corporation, which means that they are committed to a range of issues, from lessening their environmental impact to giving back to the community. The site champions gifts made in an environmentally responsible manner, including the use of recycled and organically grown materials and without the use of animal materials such as leather, feathers or fur. Small gifts and stocking fillers can often be items that either are not built to last, or they get easily discarded. I have chosen items that will be used and loved, opting for classic and useful gifts in earth friendly materials such as wood and glass. Flavour infuser glass water bottle – We all know we should drink more water, especially essential in January when it feels like the whole month is one giant hangover. Give a loved one a head start with this glass water bottle designed to allow you to infuse fruit and veggies such as cucumber in the water. Yoga Dice – This is such a cute idea for a budding Yogi. 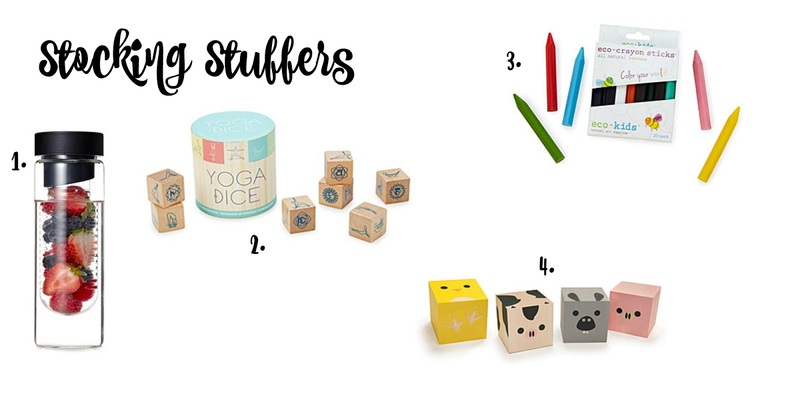 These wooden dice allow you to create fun Yoga Workouts in your living room and are sure to give you inspiration to try new poses. Eco crayons – Every child loves to colour and these eco crayons made from beeswax and safe colorants are the perfect size for little hands to get creative. Farm yard animal blocks – These wooden blocks have so many possibilities for play. Whether it is building them up and knocking them down, adding them to the farmyard or learning animal names and noises, this classic toy is sure to be a hit with the little ones. 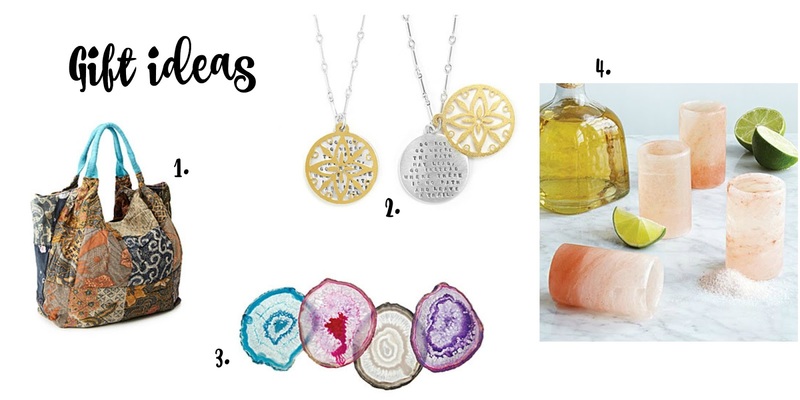 Next up we have some gift ideas for her, whether it is for a sister, best friend or as a treat to self, I have chosen items that are a little bit different to what you usually see, things that are beautiful and have the “wow” factor. Upcycled Indonesian Batik Bag – Crafted from recycled traditional Batik cloth, each of these bags uses Fairtrade cotton and has a unique patchwork design. Great for taking to a Yoga class or for an every day bag. Leave a Trail necklace – This stunning necklace made in California, with Sterling silver and gold plated brass carries a really gorgeous message: “Do not go where the path may lead, go instead where there is no path and leave a trail”. Reminding us daily to be different. This would be a gorgeous graduation gift too! Agate coasters – These stunning coasters are unique pieces made from Agate found in Brazil. Perfect for adding interesting materials and colours to a room, the artisan nature of these coasters makes them a truly special gift. Himalayan Salt Tequila Glasses – Drink tequila shots in style with these beautiful salt, shot glasses. Perfect gift for celebrations, these salt glasses looking really impressive and are durable too. Children’s toys are often made of flimsy plastic and gimmicky items that break shortly after purchase. Shopping wisely can mean that not only will the items be played with and loved, but also used by multiple children. Here are some items on my shopping list this year. Wooden block wagon – Children love pulling a wooden wagon, this one is perfect for blocks, cuddly toys and so much more! Made from classic solid Maple, this toy will be a winner with the little ones. Zip Zap Magnetic Block set – Challenge their imagination and their building skills with these beautiful magnetic wooden blocks. 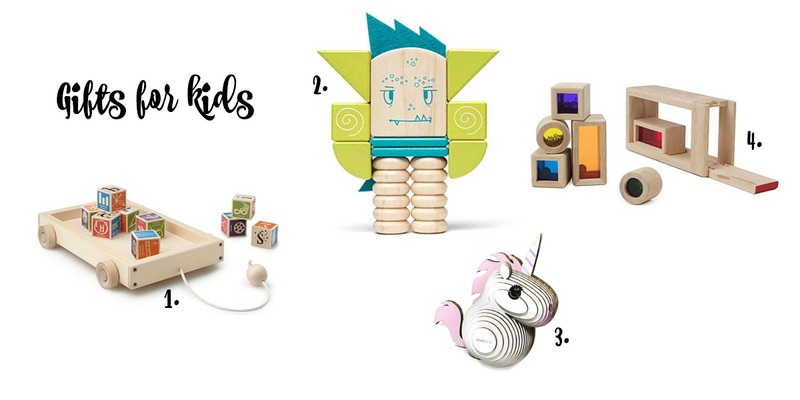 Made from sustainably harvested wood from Honduras, this toy will bring endless hours of fun. Mini Unicorn 3D Model Kit – Unicorns are massively on trend right now and kids will love this model kit made from recycled cardboard, rice based inks and organic glue. A perfect rainy day activity! Rainbow Sound blocks – These versatile blocks can be used for stacking, as musical instruments and the bright colours and textures are sure to appeal to little ones. Open ended toys that are versatile and beautiful, something to treasure and play with for years to come. Which gifts caught your eye? Let me know in the comments below! This post is sponsored by UncommonGoods. All content is created and written by me for my readers. Links are not affiliated. Please see my full disclaimer for details.